The produce will be all lined up and ready for sale at the UC Davis Farmers Market, 11:30 a.m. to 1 p.m. Wednesdays, April 4 to June 11. Spring break is short, but that’s a good thing, considering all the good things that the new quarter will bring for your health and well-being — things like the UC Davis Farmers Market and the new Fruit and Veggie Fan Club (which will distribute vouchers for farmers market purchases), and classes on bike riding, stress management and financial well-being. “Working to make UC Davis the healthiest community in the nation": Learn more and see the complete calendar of events. And, of course, a new month brings another Well-Being Ticket Deal — $10 tickets for faculty and staff to attend a show at the Mondavi Center. The April deal is for the Boston Pops Orchestra, making its Mondavi Center debut amid a tour devoted to John Williams movie music (Star Wars and E.T. the Extra-Terrestrial, to name two). UC DAVIS FARMERS MARKET — Opening day is Wednesday, April 4, and the market will continue every Wednesday through June 6. Hours are 11 a.m. to 1:30 p.m. on the Quad (north end across from the Memorial Union). An extension of the Davis Farmers Market, the campus version has a mission of increasing the UC Davis community’s access to fresh fruits and vegetables. Sponsored by multiple campus organizations, including the Staff and Faculty Health and Well-Being Program. FRUIT AND VEGGIE FAN CLUB — A free program for staff, faculty, students and retirees to remind of the importance of fruits and vegetables in our diets. Not only is the fan club free, but it can “pay” you in the form of vouchers to spend at the UC Davis Farmers Market — where you can pick up that all-important fresh produce. Fan club members will receive weekly emails with challenges, recipes and helpful tips, starting Friday, April 8, and continuing every Friday for six weeks through May 11. Each week’s email will include a link where you can report your weekly fruit and veggie progress — submit your report by 5 p.m. the day you get the email, and you will receive a $1 voucher. Submit your report every week for six weeks and you will receive an additional $10 in vouchers. Sign up online. Sponsored by Healthy UC Davis and the Staff and Faculty Well-Being Program. Sponsored by Healthy UC Davis, Staff and Faculty Health and Well-Being Program, Transportation Services, and the city of Davis. STRESS MANAGEMENT — Two-hour workshop covering causes and effects of stress, and approaches to managing stress. Instruction provided on breathing exercises, mind-quieting techniques and movement meant to reduce stress. Free; open to staff, faculty, students and retirees. 6-8 p.m. Tuesday, April 10, 130 Hoagland Hall. Sign up by calling 916-734-0718. Questions? Send an email here. Sponsored by Healthy UC Davis, and the Staff and Faculty Health and Well-Being Program, in partnership with UC Davis Health. Presented by SAFE Credit Union in partnership with Healthy UC Davis, and the Staff and Faculty Health and Well-Being Program. Keith Lockhart took the Boston Pops baton in 1995, succeeding John Williams, whose music the pops orchestra is showcasing on its tour. The Boston Pops concert is scheduled for 8 p.m. Thursday, April 19, in Jackson Hall, Mondavi Center for the Performing Arts. Faculty and staff can get tickets for $10 each (limit two per person), but only for purchases made from April 1 to 14. The concert is titled “Lights, Camera, Music! Six Decades of John Williams” — the composer for such films as Jaws, Superman, Schindler’s List, Jurassic Park and some of the Harry Potter films. Williams is the Boston Pops conductor laureate, having led the orchestra from 1980 to 1993. 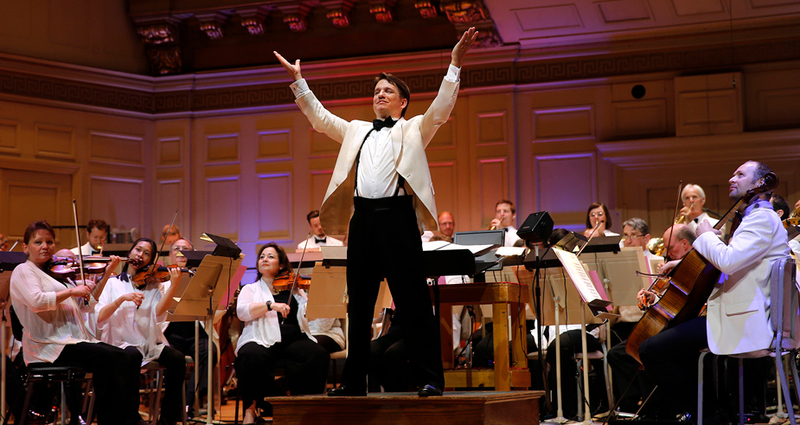 Keith Lockhart, who now leads the orchestra, calls the Boston Pops “the perfect orchestra for people who don’t know they like orchestras!” The orchestra performs jazz and pop, indie rock and big band, film music and the Great American Songbook — and everything in between. The Mondavi Center and the Staff and Faculty Health and Well-Being Program are partnering to offer a ticket deal a month through May. Tickets for the Boston Pops On Tour are available online (for the Well-Being Ticket Deal, April 1-14, use promo code ORCHESTRA2018).